Faceted Navigation, or Faceted Browsing has been a hot research topic in the area of information retrieval and classification. As a method of user interaction, faceted navigation has gained popularity in the past decade, especially among e-commerce websites. The reason is simple; comparing to traditional methods, faceted navigation makes it easy to find what you want, especially when you don't know what the website has to offer. So what is this user interaction anyway? Take a look at the list of interactive filters on The Rentables (therentables.com). That is faceted navigation. 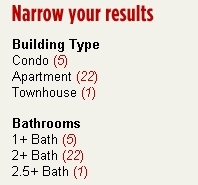 You can filter the data by building type, unit type, number of bathrooms, etc., and each of these fields is a "facet". The keyword here is "filtering", which is fundamentally different from a simple search. A search form, regardless how many fields it has, works like a funnel. The search results are those who match the criteria, but you don't know what you have missed as each criteria is applied by the search engine in "black box" fashion. Faceted navigation, on the other hand, summarizes the information beforehand, so that the users are aware of the trade-offs they are making when applying a filter. So how can you use faceted navigation to empower your business? The obvious application is retail. If you operate an online store selling enough many products, you are most likely in need of some interactive filtering capability. Before you jump on it, though, ask yourself whether your products have enough "diversity". In other words, in how many ways are they different? If they are only different in color, a drop down list will suffice. Once they are also different in price, model and size, faceted navigation starts to make more sense. Faceted navigation is also useful to capture the "shape" of your internal business activities. As your company grows, the tasks and people you deal with also become more complex. Just like the ineffective search form, you cannot look for potential problems when you don't know what kinds of problems there could be. But when all the issues are summarized by their facets, the outliers stand out. What facets do you want to navigate on, in the context of your business? How will the navigation system impact overall performance? Does the navigation need to reflect instant data changes? Do you have any exception rules to this interaction? There are many open source faceted search libraries. Some content management systems also offer plugins with support for interactive filtering. Whether to use these out-of-box solutions versus custom implementation depends on your existing IT infrastructure and the nature of your business. You'll be surprised to know that in many cases, it is both more flexible and far more economical to build faceted navigation from ground-up, assuming you have experienced developers.